This is a huge invention in fabric because the warmer the material, the heavier the fabric became. 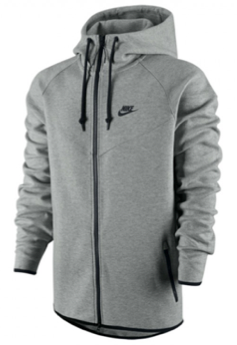 Nike Tech Fleece has eliminated this issue. The fabric is an innovative thermal construction that merges jersey with a synthetic spacer, allowing body heat tobe trapped to create warmth without adding weight. Nike was also able to retain the original feel of their classic fleece because the double-faced jersey is smooth to the touch inside and out. There is an inherent appeal to this new fabric because almost everyone owns a hoodie or pair of sweatpants made of the classic cotton fleece. This new fabric will make classic styles much more warm, yet breathable, for enhanced sport performance. Personally, I really like how this new material still looks like the original; Nike has managed to maintain its form and structure. The fabric construction is relatively new and is only available in three colours: heather grey, dark grey and black. In time, I hope Nike will produce this fabric in a variety of colours.